Were killed on behalf of the doctrines of the fathers. 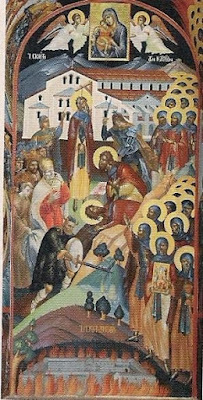 These Holy Venerable Martyrs were Athonite Monks from various cells, who resisted Emperor Michael VIII Palaiologos and the Latin-minded Patriarch John Bekkos (1275-1282), and they were martyred when Latin-minded Uniates came to Mount Athos. 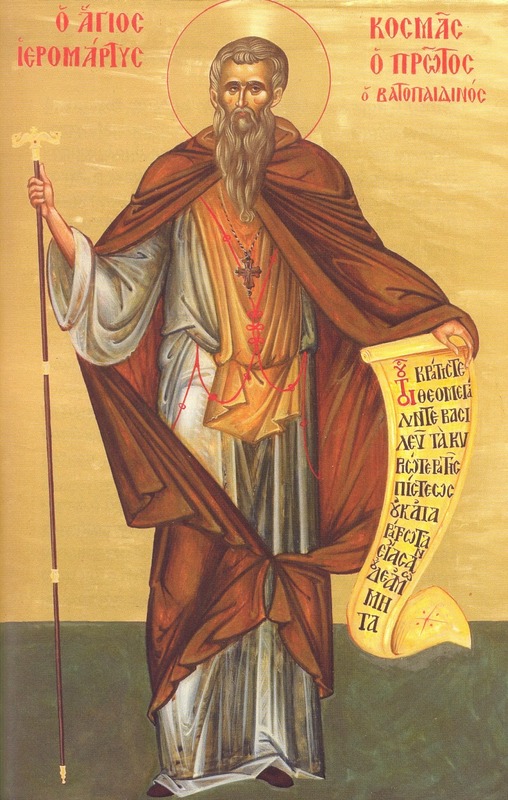 Saint Kosmas the Protos of the Holy Mountain was hanged, while the others were beheaded. 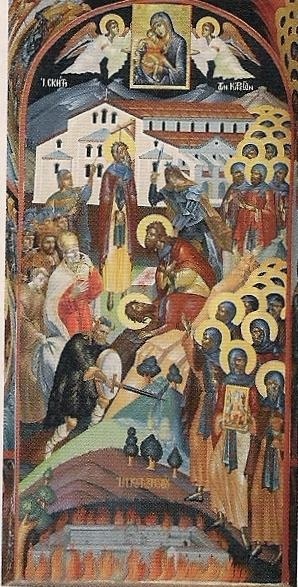 During this visit of the Latin-minded Uniates, monks of the sacred Monasteries of Vatopaidi, Iveron, Zographou and Xenophontos were martyred. According to one tradition, Emperor Michael VIII Palaiologos led a military group and captured the monks of the cells of Karyes, as well as the Protos of the Holy Mountain. After being rebuked by the monks, the emperor was enraged and had them killed with swords, while he set fire to the Protaton Church. A contemporary writer says that the monks who lived in cells around Karyes were ordered to gather together, headed by the Protos, in order to concede to the union with the Papal Church, that is, to become Latin-minded and accept Latin doctrines. This proposal was seen by everyone as a betrayal of Orthodoxy, and they all responded that they would rather die as martyrs for the Orthodox faith. In vain the representatives of the emperor threatened them with horrible deaths, but the Athonites of Karyes and the Protos were unconvinced. They were thus given over to be tortured, but the more they were tortured, the more firm they became in their Orthodox faith. For this reason Kosmas the Protos was sentenced to die by hanging, while the rest of the monks were sentenced to be slaughtered with the sword, thus making the sacred land of Karyes red with their blood. Their martyrdoms, especially that of Saint Kosmas the Protos, was confirmed by the disinterment of his remains, carried out by the Holy Community in 1981 on November 18th, on the spot described by tradition, where there was always a lamp burning. Saint Kosmas' relics rest in the Narthex of the Church of Protaton in Karyes. His primary feast day is on December 5th, and the feast of the translation of his relic is on November 18th. A complete Service of Praise and Suplication Service was composed for him by the Hymnographer and Hieromonk Athanasios of Simonopetra.